Heiting & Irwin APLC began in 1976 out of a deep commitment to the fundamental values of the American justice system. In that spirit, we’ve dedicated ourselves to obtaining justice for each and every client. Our firm is headed by James Heiting, who was elected the President of the California State Bar, serving his term as President 2005-2006. Our attorneys sit on respected local, regional and statewide boards. 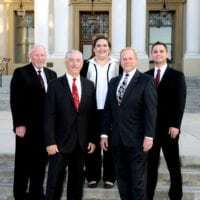 They work hard to ensure that our clients’ rights are preserved and actively promote ethical values and professional behavior on the part of all California attorneys. We also have an accomplished support staff of legal assistants, interns, researchers and investigators–each of whom is dedicated to ensuring that justice is fairly serviced. You’ll never have to worry about navigating layers of legal middlemen at Heiting & Irwin APLC. You’ll always have direct access to the lawyer handling your case and your phone calls and e-mails will be returned as soon as possible. We keep you informed of the progress of your case and will gladly answer any questions and address any concerns you have before, during or after your case. Our attorneys know how to listen. We will do everything we can under the law to win your case. But we want to insulate you as much as possible from the emotional, financial and personal stresses of the legal process. We consider it our responsibility–and our privilege–to advocate for you during what may be one of the most difficult times in your life. Initial consultations are always free and can be handled in person, over the telephone, or by email. If you wonder if you have the basis for a case, contact us today. We can assess your case to determine your rights and if you are entitled to recourse under the law. We operate on a contingency fee basis. This means that you pay nothing unless we win your case or reach an acceptable settlement. In many cases we advance all expenses required to win your case, and we have the experience to successfully litigate any type of personal injury case you may have.